Borrowing a page from David Leigh-Smith, I have imagined the following story to accompany my presentation of the Hasegawa 1:48 Hawker Hurricane Mk IIc “Hurribomber,” presented as a Free French-operated fighter bomber in the North Africa campaign leading up to the culmination framed by the Kasserine Pass Group Build It is therefore background work for the North Africa scenario, not Kasserine Pass itself. Émile Richaud, the pilot, has arrived at his post in Egypt through a perilous journey. His family has a long and proud history of service to France. His father, André, a Great War veteran, survived Ypres and was wounded at Verdun, but recovered and established his family after the war, earning a decent living as a small businessman making specialized tools for Peugeot, though the Richauds resided in Paris. When the Germans overran France, Émile and his two brothers fought valiantly, but his elder brother, also a pilot, was killed in an engagement with 109s, and his younger brother, and infantryman, became a POW. At the urging of his parents, a bitterly sorrowful Émile parted from them and his sister and evacuated to England, eventually consolidating with compatriots to form the Forces Aériennes Françaises Libres. Just before he departed for North Africa, he learned through clandestine channels that his sister had joined La Résistance (hence the news), and that his father had been impressed into service as a “guest worker”; he labored for pathetic wages at the Krupp plant in Essen, but at least there was food on the table back in Paris as a result. It is with a particular sense of deliberation, then, that Émile pilots his tank killer: not only had the German beasts rolled mercilessly over his homeland and childhood memories, but his own father was being forced to make them. 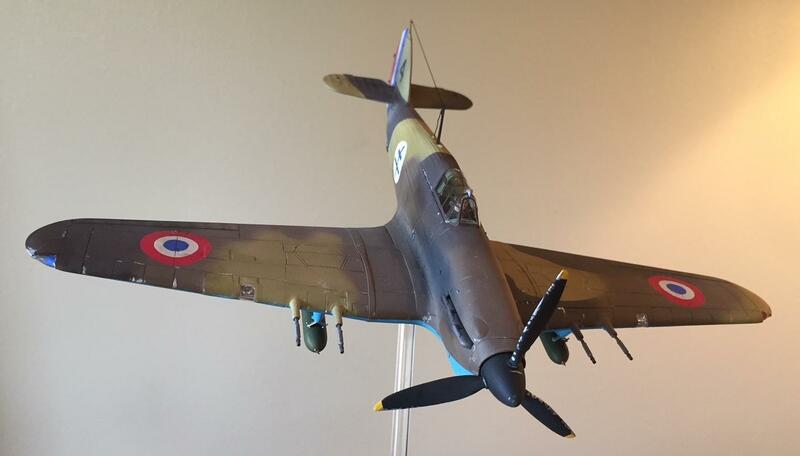 This was Hasegawa’s “Croix de Lorraine” 1:48 Mk IIa/b Hurricane. 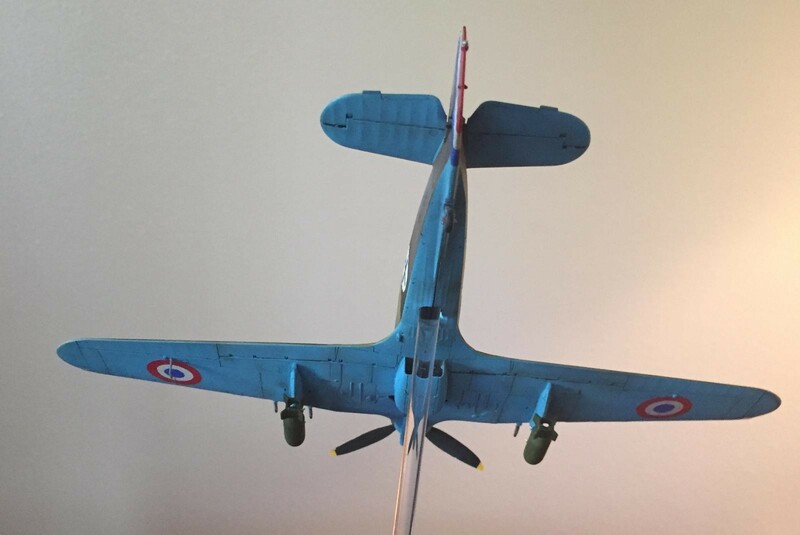 I liked the kit just fine, but unfortunately some pieces were missing, including those wing sections that would have enabled me to properly configure the airplane as a Mk IIa or b! Well, I like the cannon in the wings anyway, so presto! 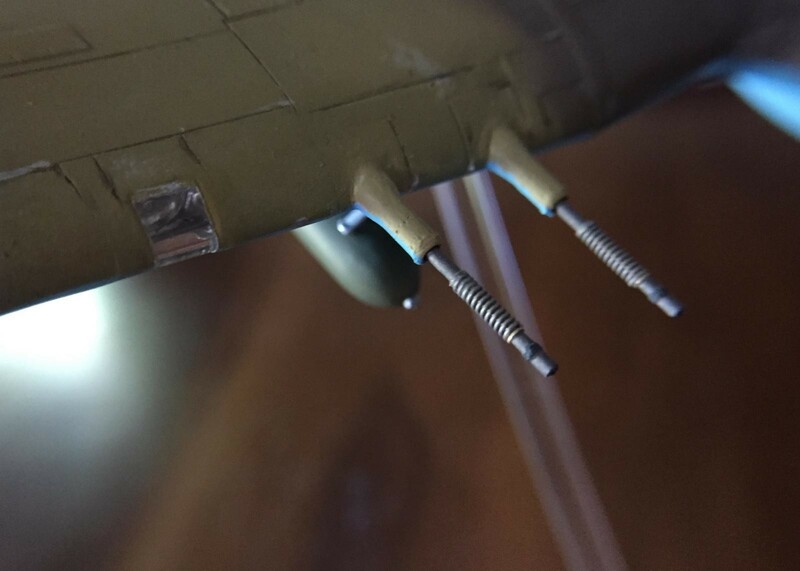 we have a Mk IIc, which I decided to work up as a full blown “Hurribomber.” I had two problems, though: first, I didn’t have the actual cannon—just the proper wing pieces. Oh well, there goes my “out of the box only” oath. So, $15 later, I have the aftermarket cannon I need. 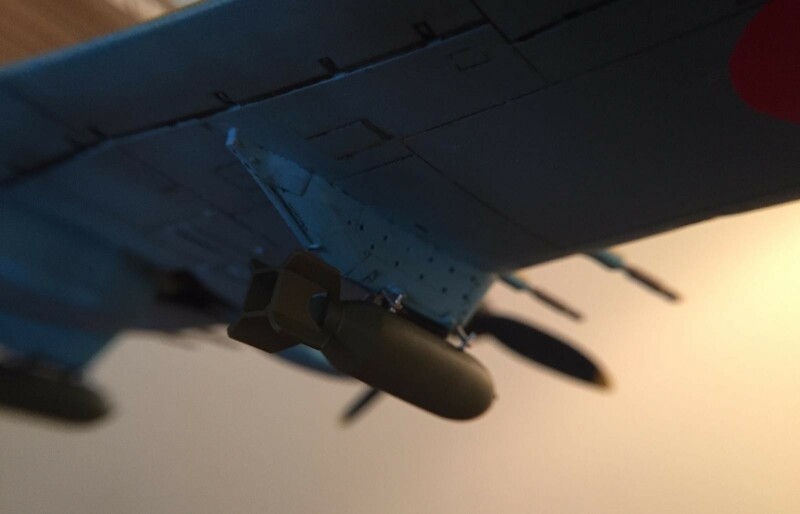 Next, I pirated the bombs and bomb racks from another kit and was surprised how close they resembled photos I found of Hurribombers. Furthermore, sometimes the Croix de Lorraine roundel was placed next to the standard roundels on the wings, sometimes not. Bernie Hackett gave me some much-needed advice by pointing out that exiled Free French troops would have had to content themselves with RAF insignia colors in French configurations, because beggars can’t be choosers when it comes to field supplies; we must think of wartime footing and not ideal circumstances all around. In any case, I didn’t like the decals. Even if I were to imagine the dubious scenario in which the French blue were available, the red of the decals was far too orange. What you see is the result of me using a circle cutter with Tamiya sheet mask; the tail is also painted. (I’m OK with the results so long as I’m not wearing my magnifying headgear.) The Croix de Lorraine insignia on the fuselage are modified decals because I wanted them blue, not red, and Hasegawa didn’t offer an option. 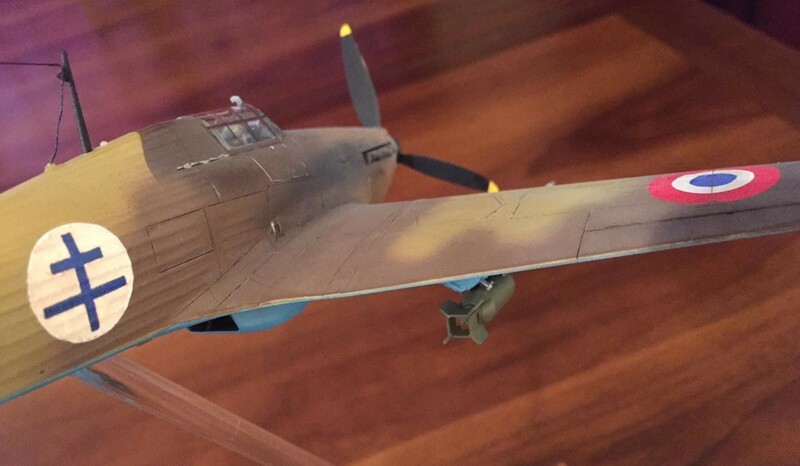 As for the overall paint scheme, I painted as if the Hurricane originally had the middle stone/dark earth scheme (sharp edges between colors), then was modified in the field with yet another dark earthen color (soft edges), because this is logical to me and follows the artist rendition I present here. Colors are Mr. Color lacquers with a sparing use of enamels and acrylics at finishing stage where needed. I pre-shaded the panel lines then finished with water colors and weathering powders I bought cheap at a model railroading store. The significance of this iteration of the Hurricane in North Africa is that fairly early on—at least a year and a half before Kasserine Pass—the Hurricanes began to be seriously outclassed by the newest 109s. 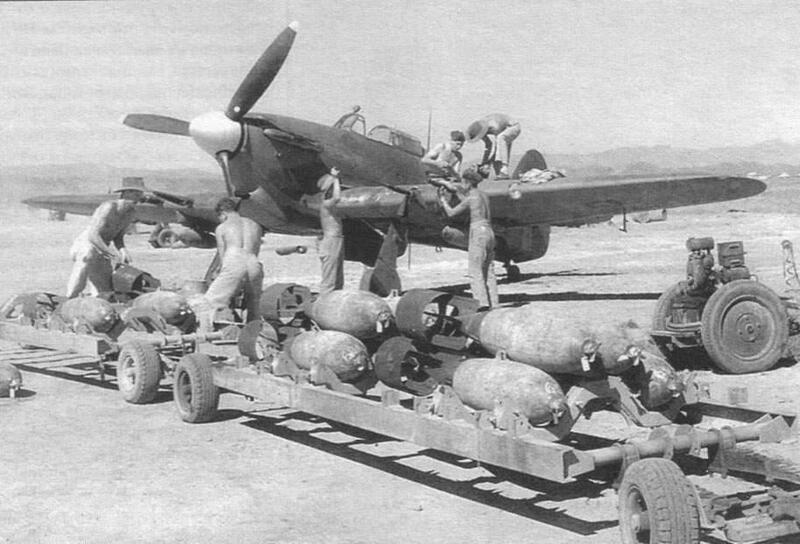 The new generation P-40s, ironically, had far more parity with the Germans by that point than the older Hurricanes (to wit, our GB has some great P-40s built by Louis Gardner). 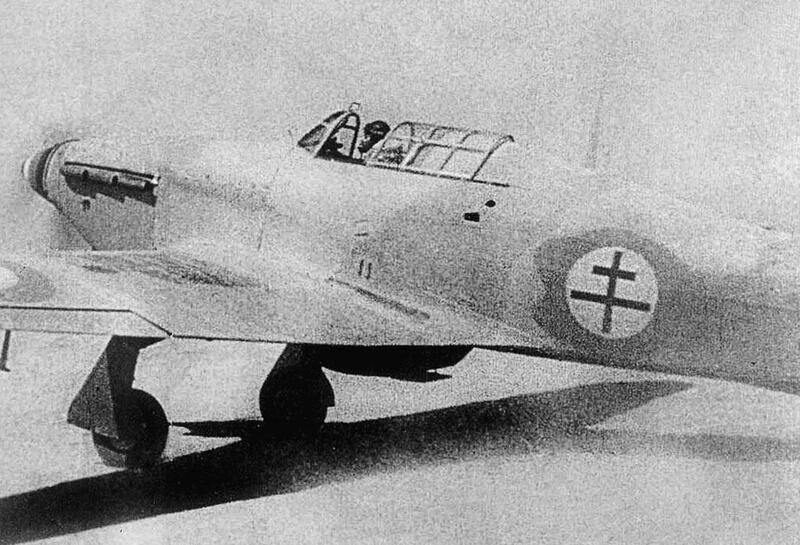 Waste not, want not, though: Hurricanes were modified with the Hispanos and loaded with bombs, and became much more useful as tank killer/ground support aircraft. Overall, the model is an homage to my compatriots in the Kasserine Pass GB, and if I may be so bold (and take the risk of slighting someone, which is not at all my intention), I would like offer credit to some friends in particular: Louis Gardner and Tom Bebout, who’ve been so very supportive with multiple build contributions (others have made multiple offerings as well, or are in process, but these guys are over the top, especially the Legendary Louis!). Greg Kittinger is to blame for my adoption of the “wheels up” approach on the last couple of builds. I won’t be as dogmatic as he, but I like the option and his presentation technique is simply fabulous. 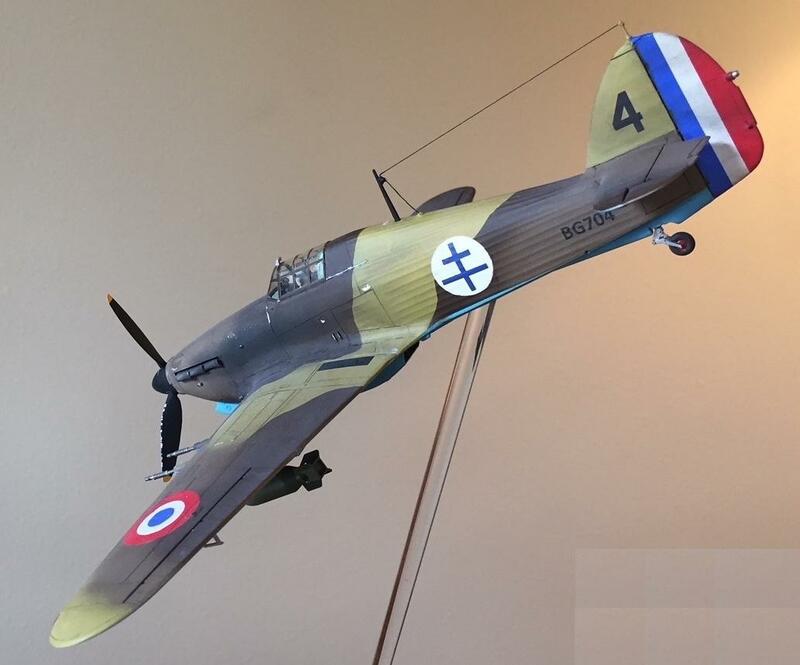 I also liked his Hurricane built for the selfsame GB, which obviously prefigures mine. 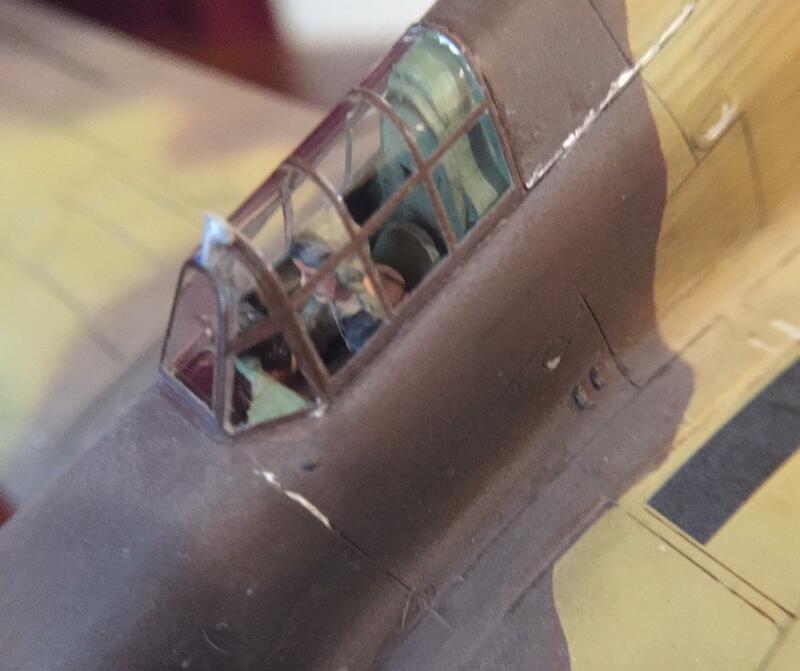 Bernie Hackett is a tremendous aid on the historical technicalities of these things and, most of all, the gift of perspective in a hobby that lends itself to losing that virtue altogether. Lastly, credit for my overactive narrative imagination, so shamelessly imposed upon you all, goes to David Leigh-Smith, whose running narrative is one of the more entertaining things on iModeler at the moment; if you haven’t caught it yet, you’re the poorer man for the loss. She’s a real beauty David! I love all the choices you made – scheme, colors, etc. And to set her in a diving attitude was a nice finishing touch! Love it! Thanks, Greg. You taught everything I know about the mounting techniques. Appreciate you brother, and your prayers. I recognised the mounting as a ‘Kittinger’ job straight away. Should get that trademarked, Greg! Fantastic, and an idea I’ll also be shamelessly replicating in my next build. I have to say, it’s clean, it’s simple, and it is so much more elegant than the nonsense different manufacturers have produced. You can buy an acrylic rod for pennies, and at whatever diameter you want. Get a drill bit the same size and a cheap wooden base and you’re set. I think this entire base and mount was less than $5. Absolute marvel, I like everything about this build, the colors and the display stand! Kudos David! A great compliment coming from you, Michel! Thank you! 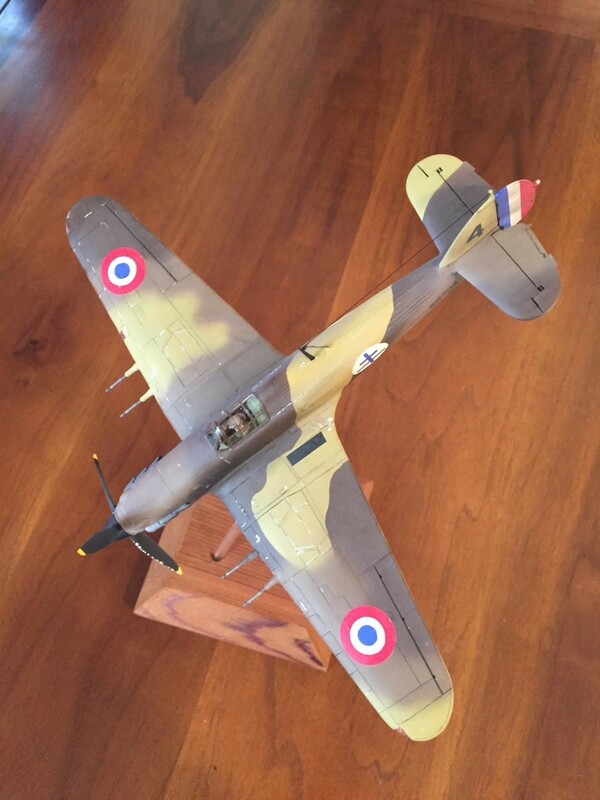 A most comprehensive and informative narrative, David…and a really nice build to boot! Verbosity is family trait, I’m afraid…thanks Craig! What a sight, to see a wheels-up-and-diving Hurricane. And in gorgeous French plumage, to boot. 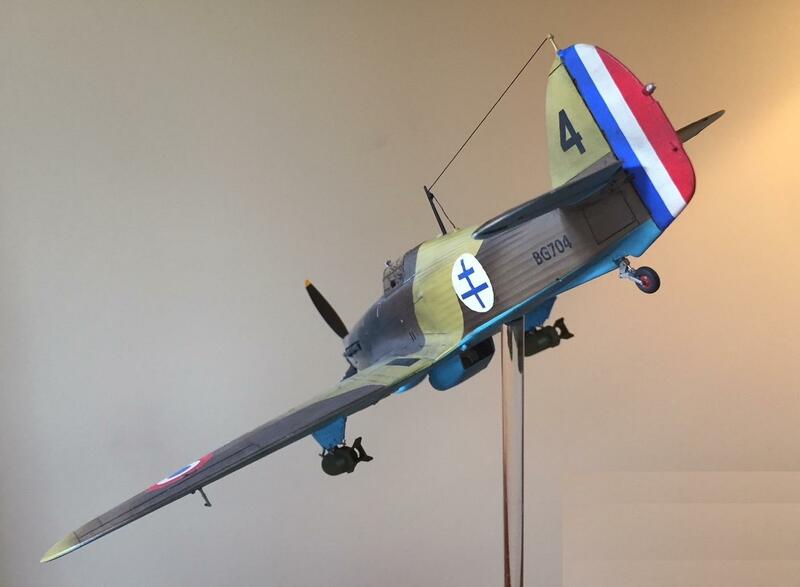 Fabulous build, David, and one that oozes creativity, skill, and no little ‘joie de vivre’. You’re a blessing to me, brother, for real. Thanks for the support and the inspiration. David, much as I enjoy the modeling, it’s the social aspect of this community that gets my respect. Like some others here, I can be a bit disillusioned and feel more connected to my friends and brothers on iModeler than I do with ‘real’ people. Some may find that sad; me? I’m delighted to have you guys. I’m in a chapter of life right now where all I can do is agree with your sentiments…thanks, Tocayo. A great build!! Love the stand. The stand is a $3.49 pre-manufactured deck post cap, bought at a local lumber store. The acrylic rod cost me less than a dollar online. I put on a couple of coats of natural stain and then sealed it with a varnish. Easy peasy. David, you’re making me blush! Really looks good! You were a big help, Bernie. Thanks so much. David – all I can say is WoW! 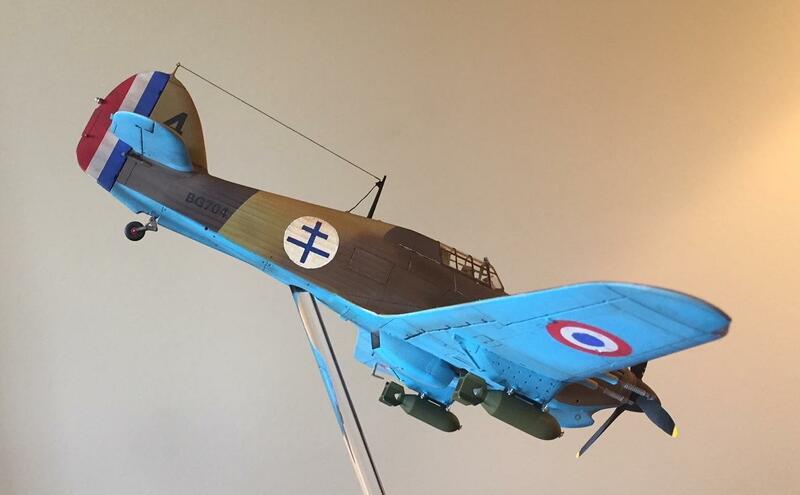 What’s not to like; a beautifully built & painted Hurribomber, a wheels-up and realistic “pose,” and a really well-done mount that shows it all off beautifully! That’s one good looking Hurricane my friend. Really glad to see you got her done and I especially like the realistic weathering. Not too much, not too little, but just right for my taste. I encourage you to take that bad boy to the upcoming model show in your area and put it on the table for folks to see. I assure you it will be a pleasant experience. Nice job. Thanks, Tom. The show is Saturday. Sadly, it is a date the IPMS chose just as my final week of classes begins. It’s a nuts time. But I appreciate your encouragement and kind words. 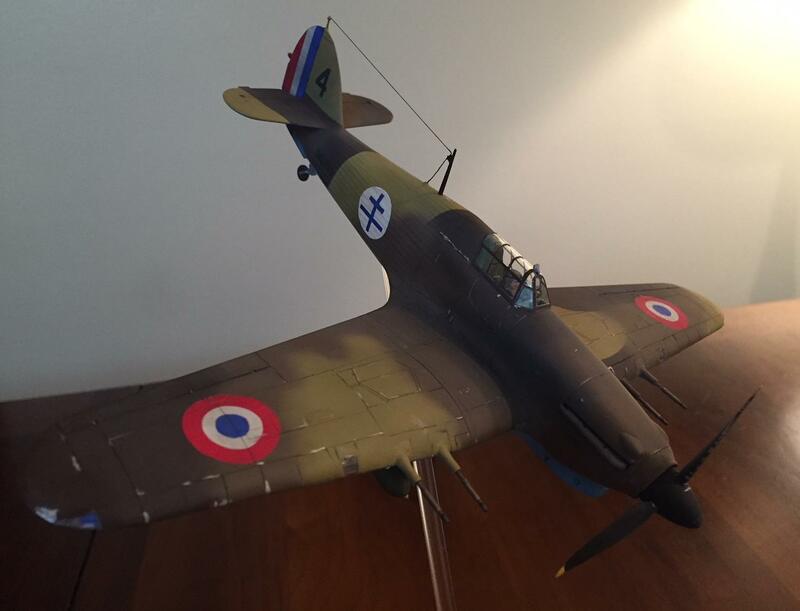 Fantastic job Dave, never seen a French Hurricane before , well done pal. Thanks, Neil. You’re a friend for sure. It strikes me that since re-entering the craft I’ve done American (Navy, USAAF), Japanese, and French, but I have yet to do a Brit plane. What’s wrong with me?? Great work David! The diving motion is captured just great. I like those French colors, they make quite a change to the eye. And a interesting historic story as well. Thanks David. Thanks, Ferry. You are a true artist, so I take that a high praise. I would consider calling this one your “Goldie Locks” plane. Not too little, not too much, but just right………….. 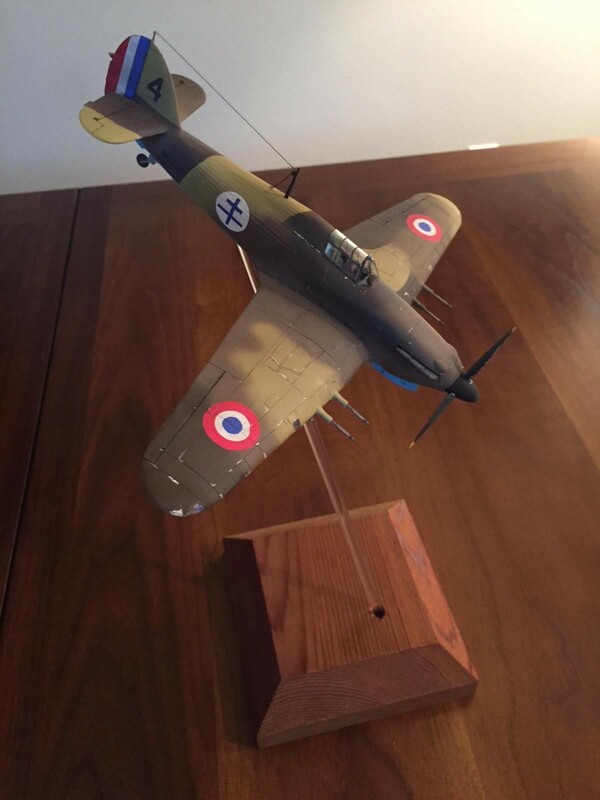 I like it, and like it a LOT……….. You just don’t see Hurricanes built up that often, much less wearing French markings………. The story line is very good too, my hat’s off to ya !!!!!!!!!! Two thumbs up Sir !!!!!!!! Sorry for the late reply………………. Thanks, Louis, you’re prince and a friend. Best to you and you deserve all the laurels I can throw your way!